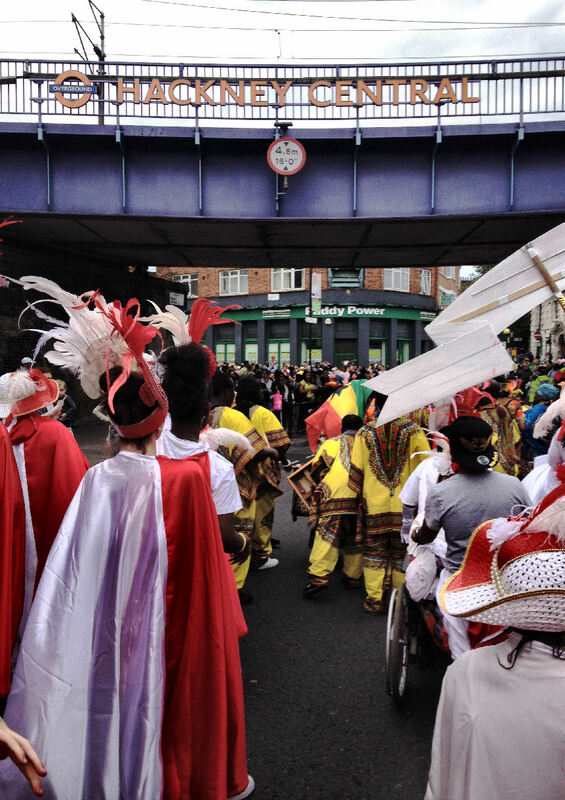 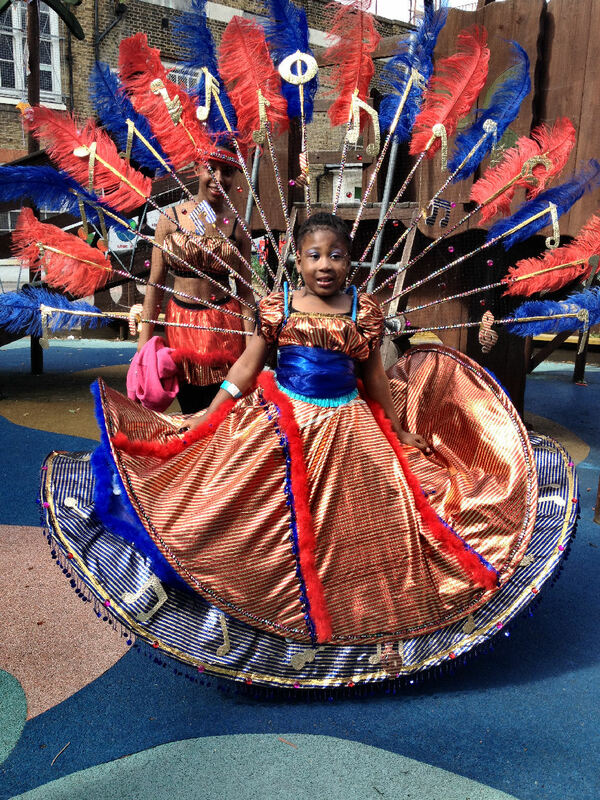 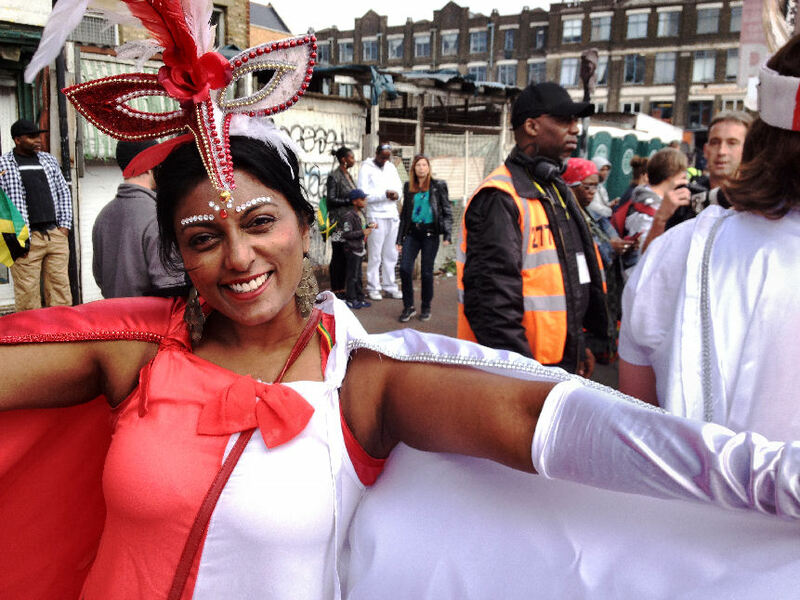 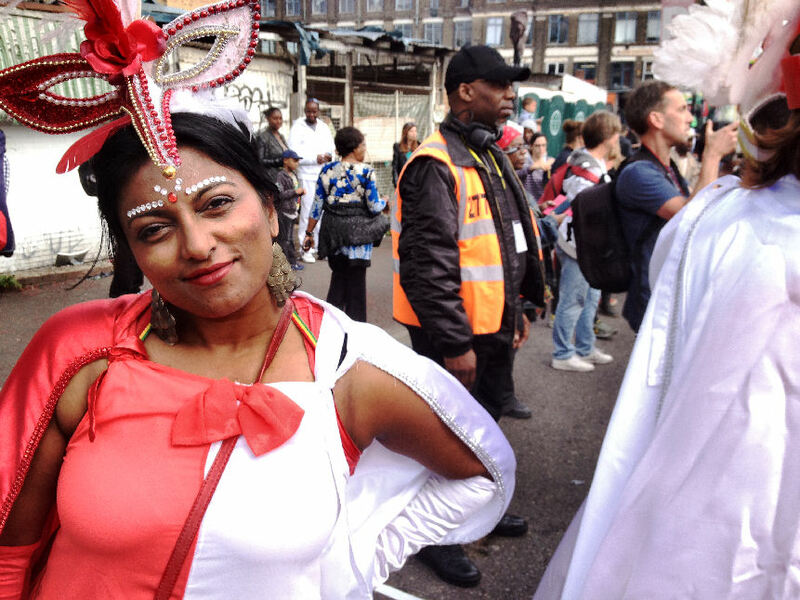 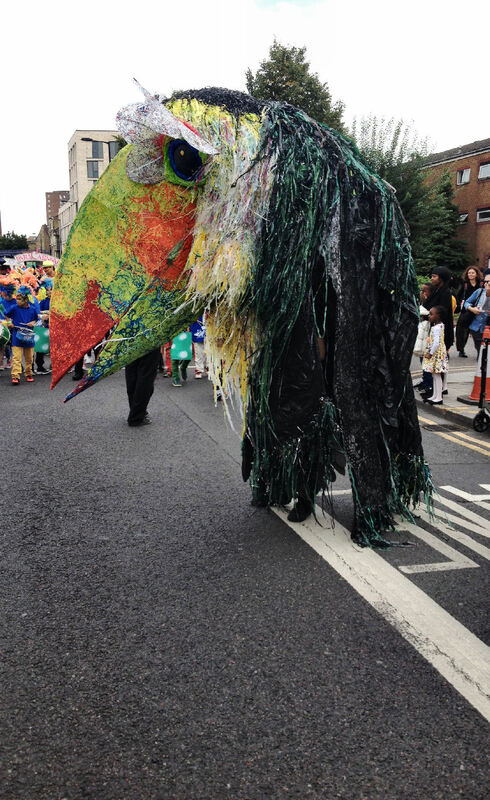 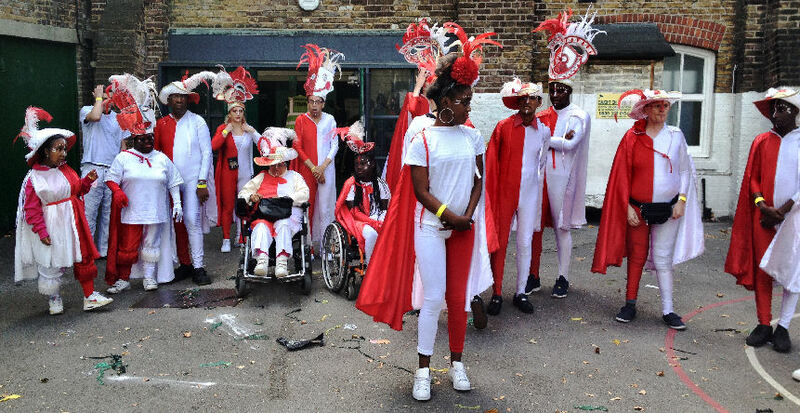 Day 2 was spent behind the scenes and on the procession with Paracarnival (Bringing Carnival Therapy to Special Needs) at the Hackney Carnival. 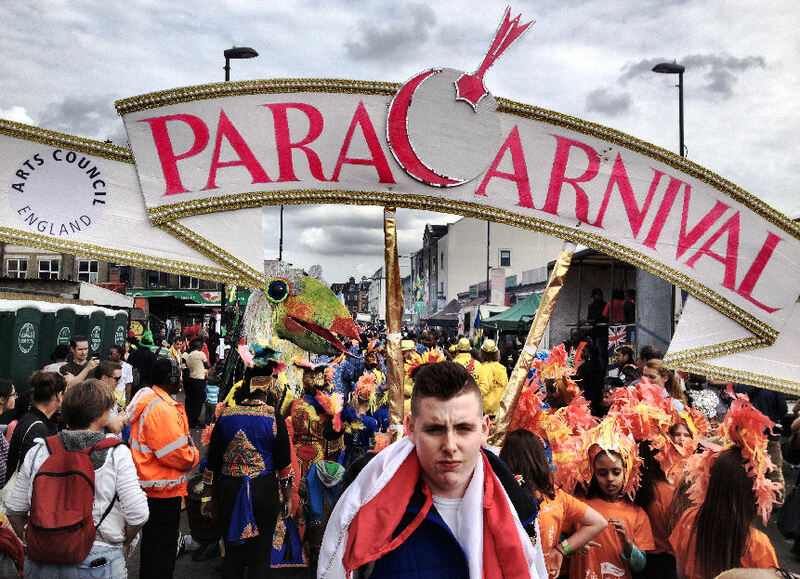 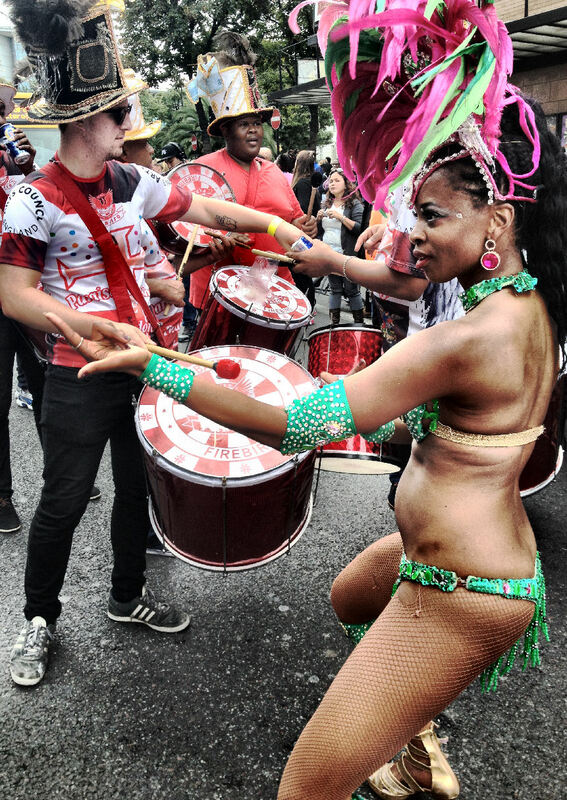 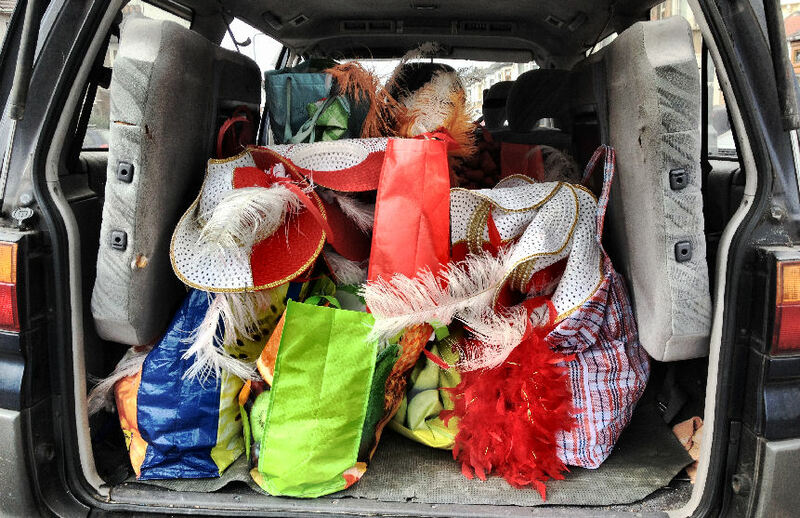 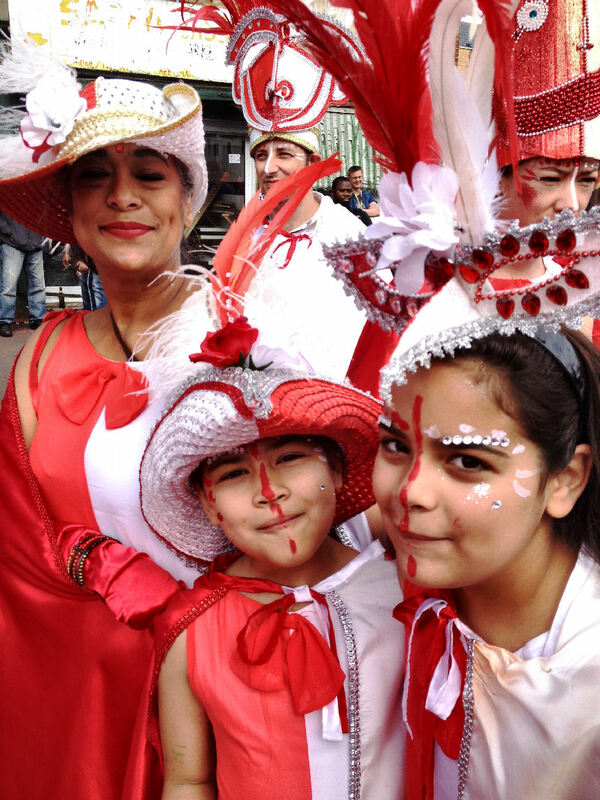 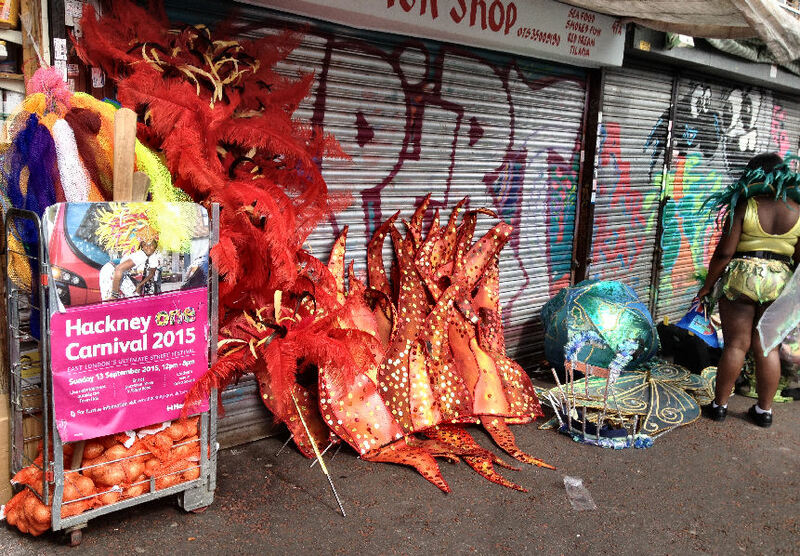 Paracarnival is attached to the Paraiso school of Samba. 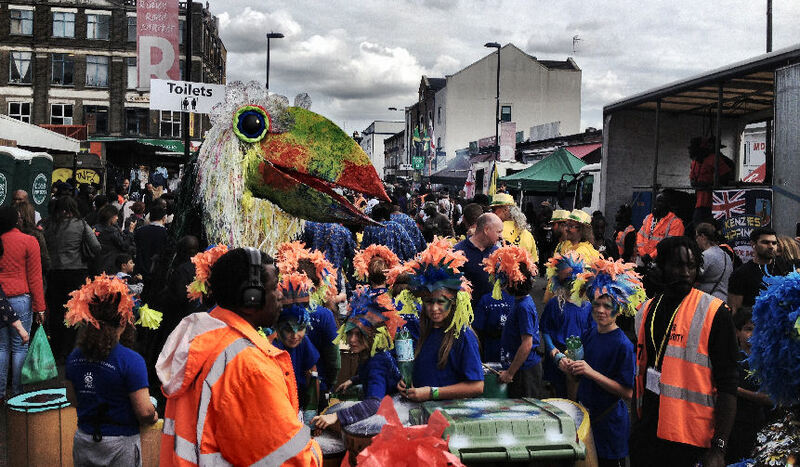 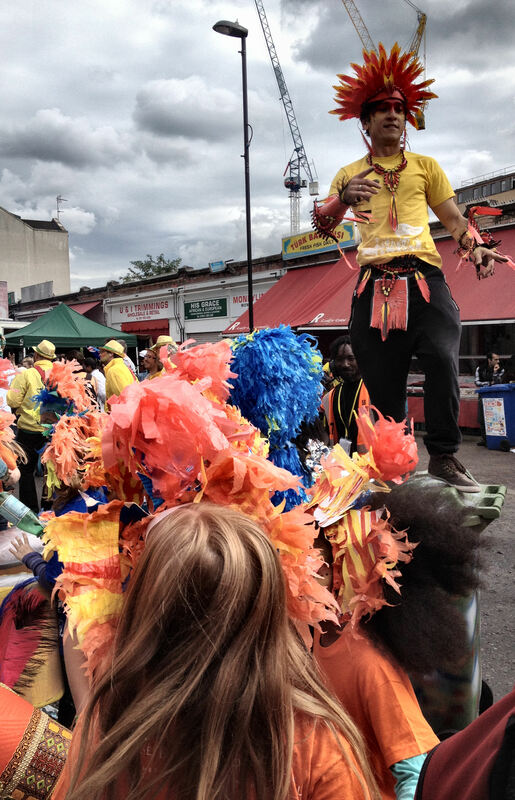 Hackney Carnival has the feel of a Notting Hill Carnival 25 years ago: less policing, though still a presence, crowd can move freely, space on the pavements, no overcrowding, shops all open and people engage with the crowd. 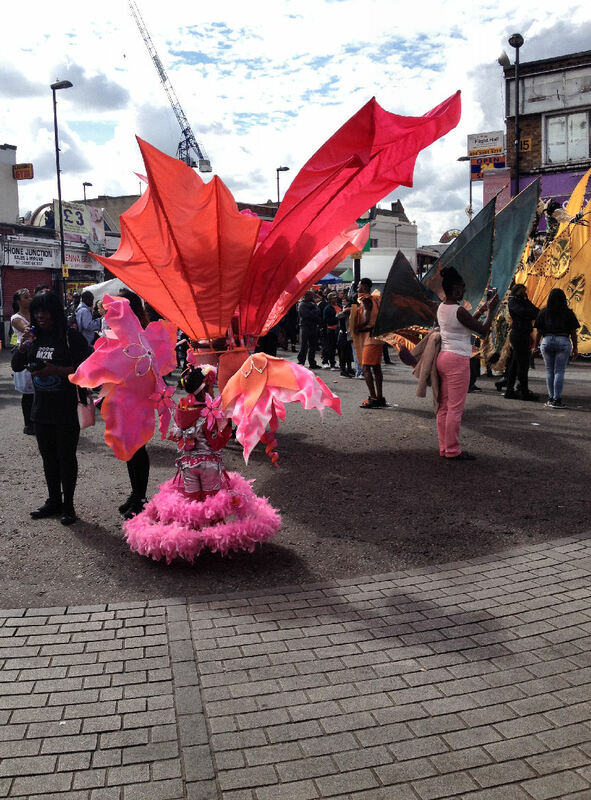 It feels lighter , it feels safer, its a great street event platform for people to get involved and engage in. 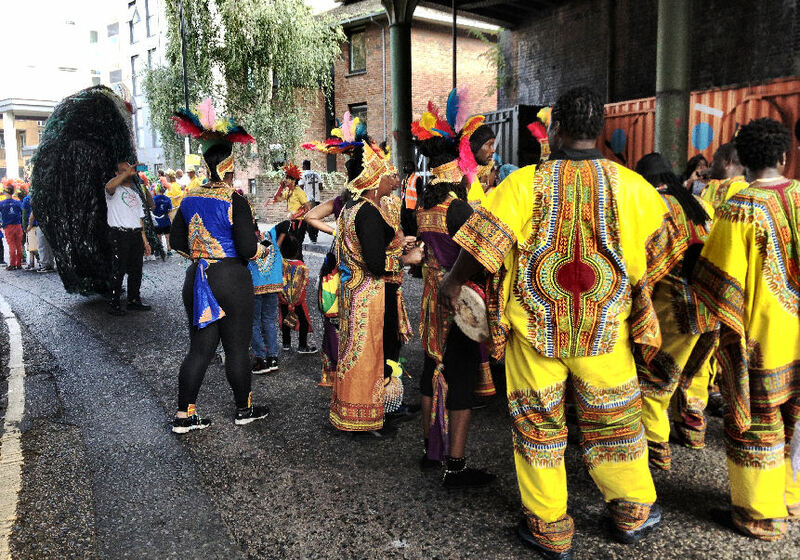 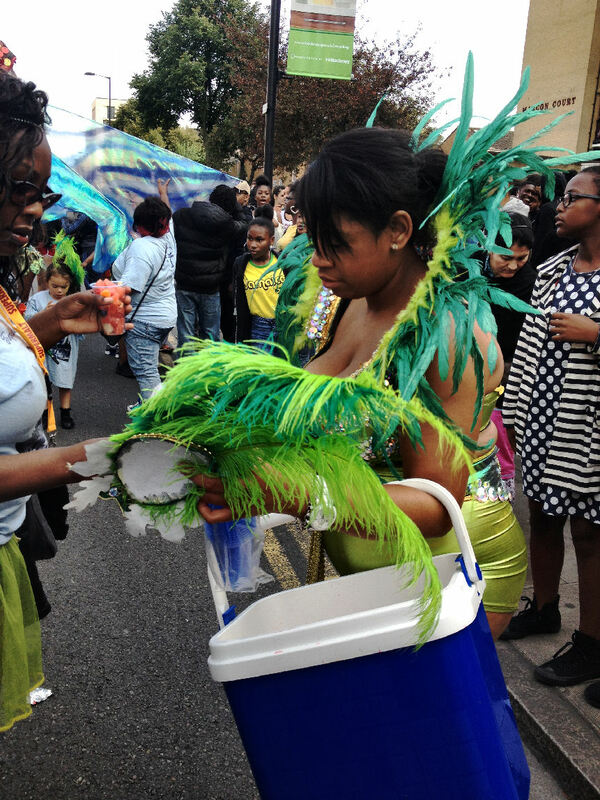 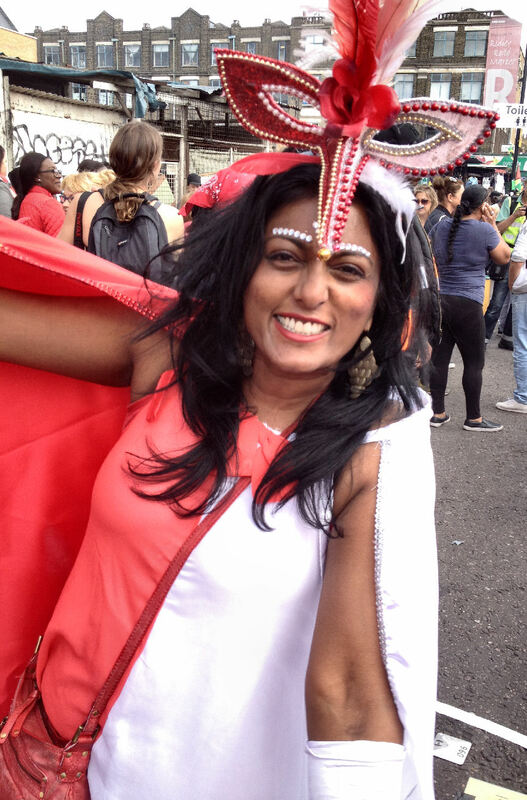 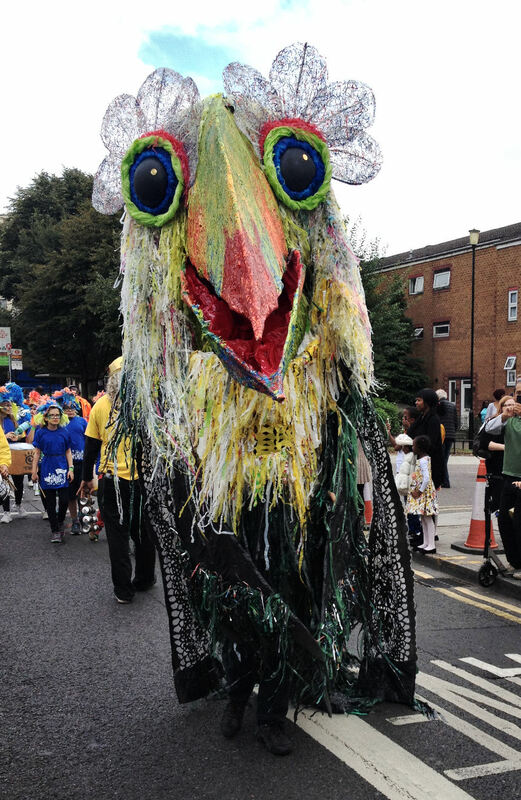 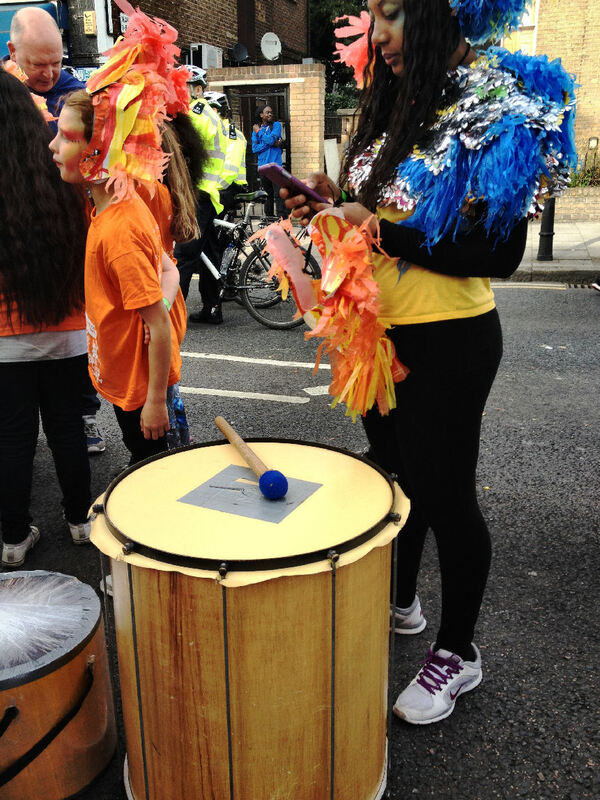 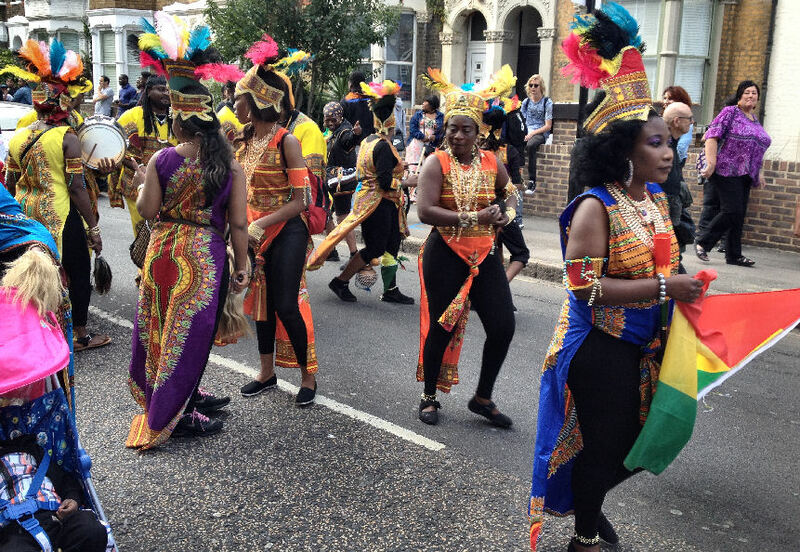 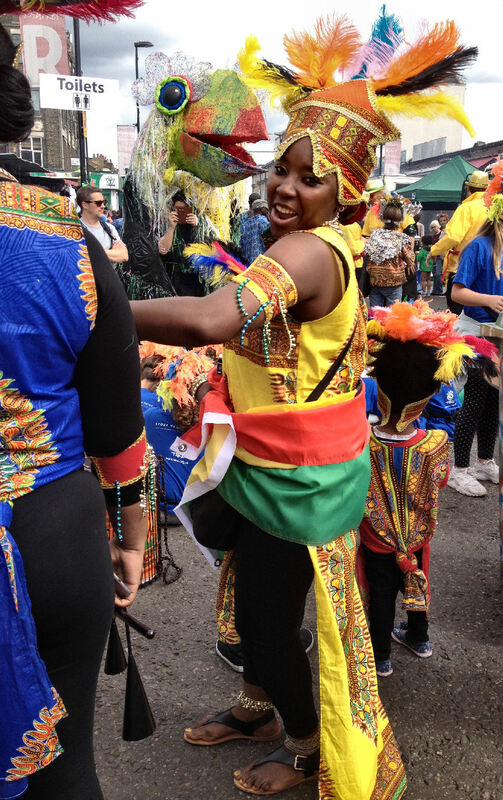 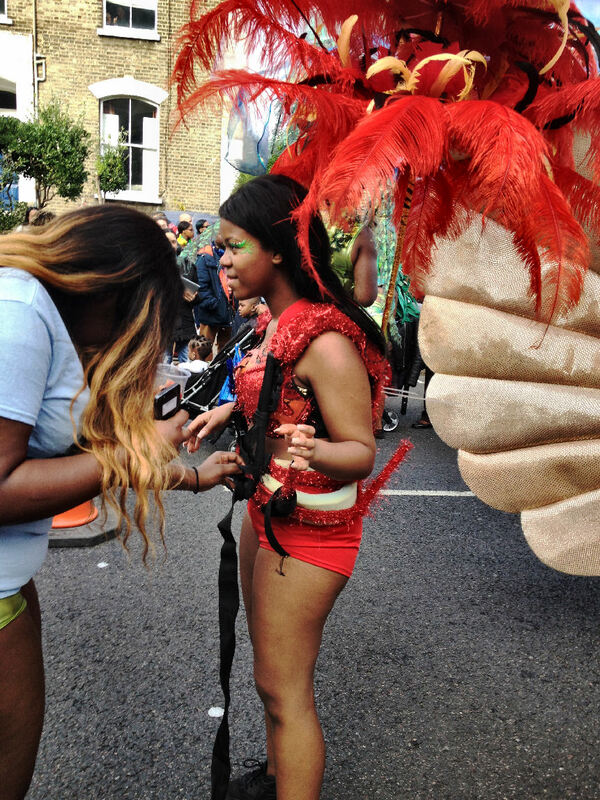 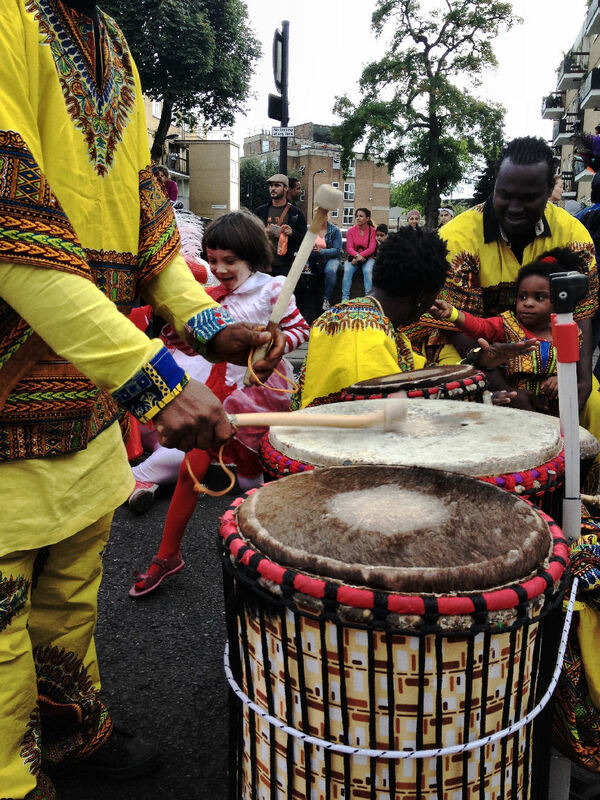 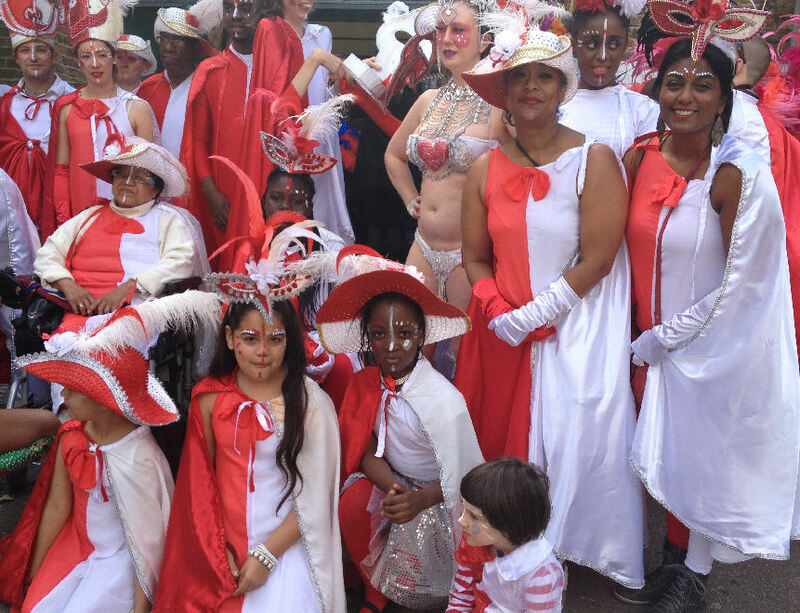 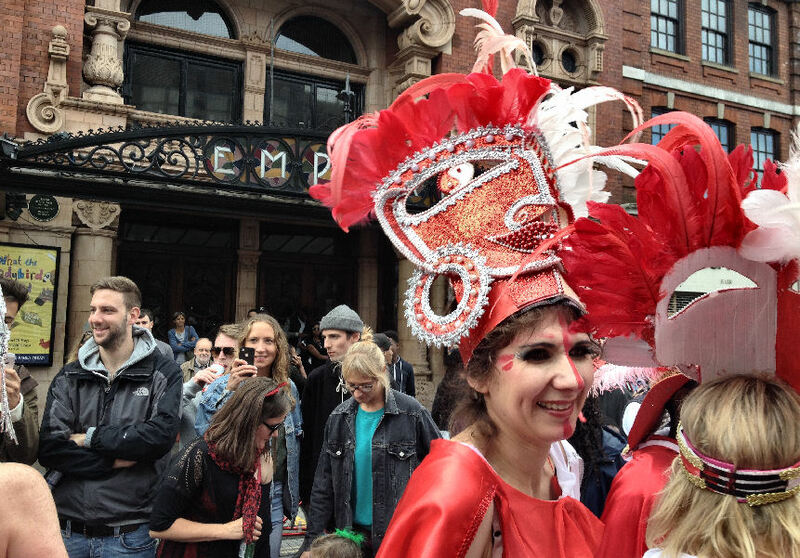 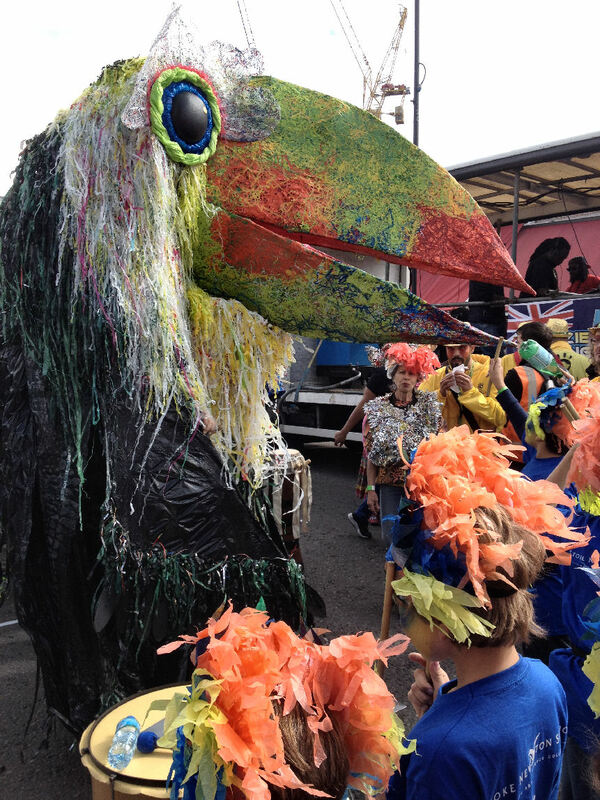 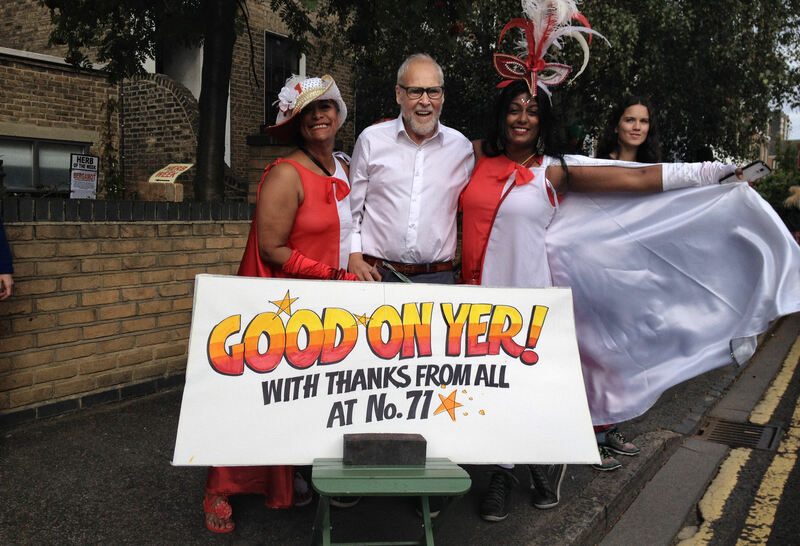 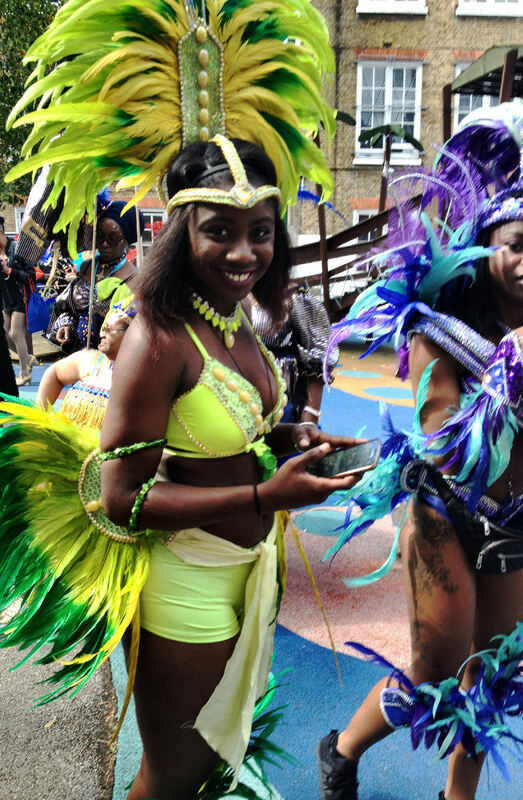 We signed up to help making sure everyone performing in the Paracarnival group enjoyed the event, participated and kept up with the procession, the moves and were able to engage with the spirit of Carnival. 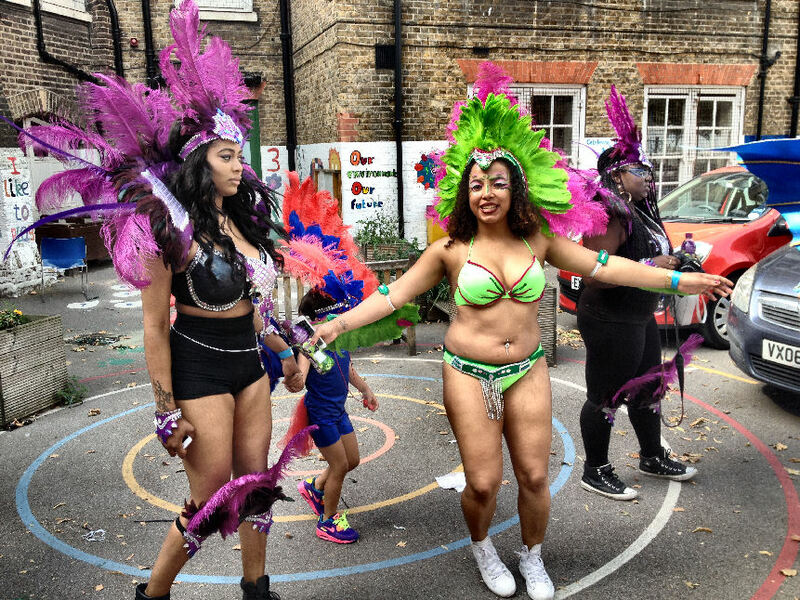 Supporting the Carnival Group meant we also had to costume up and dance it out for 5 miles while working with the group. 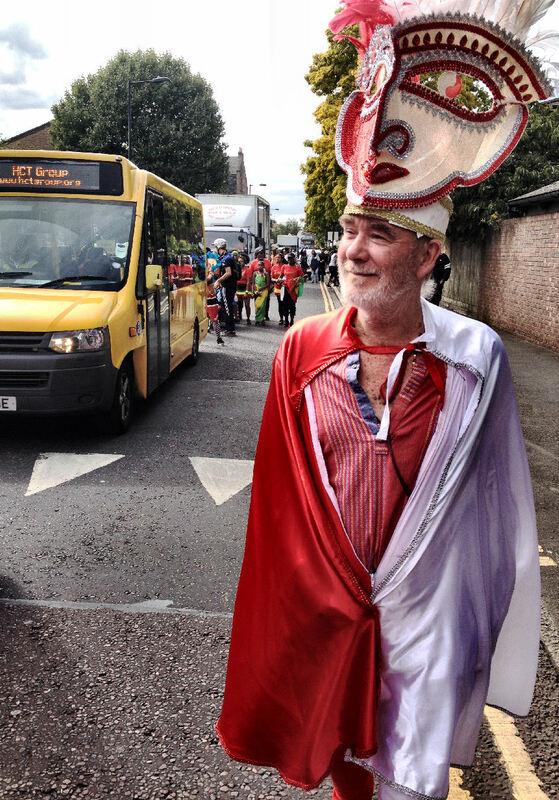 The Carnival parade placed a support bus behind us so that we were able transfer any one flagging in the group. 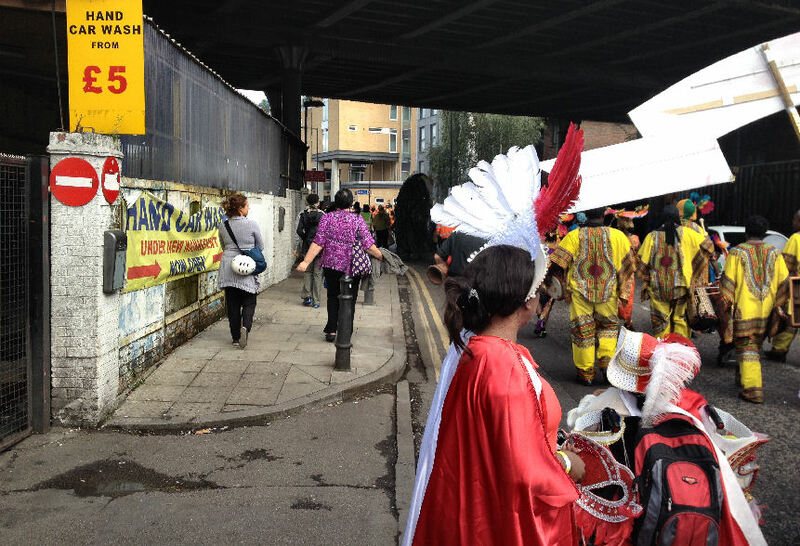 The route being 5 miles this can really be quite heavy work on some of the participants. 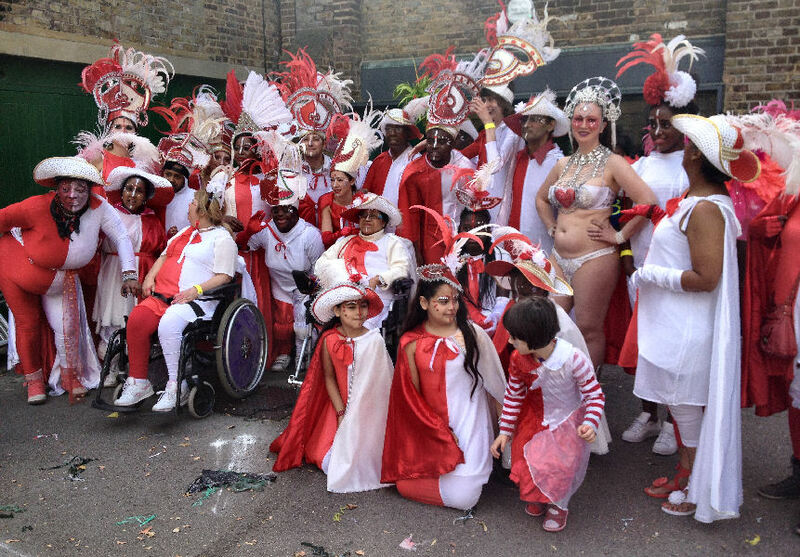 Carnival Therapy is an excellent way to create Special Needs engagement into mainstream celebrated community events, though it must be remembered that where other groups only have to focus on the dance and costume aspects of the procession, the Paracarnival has to think that one step ahead. 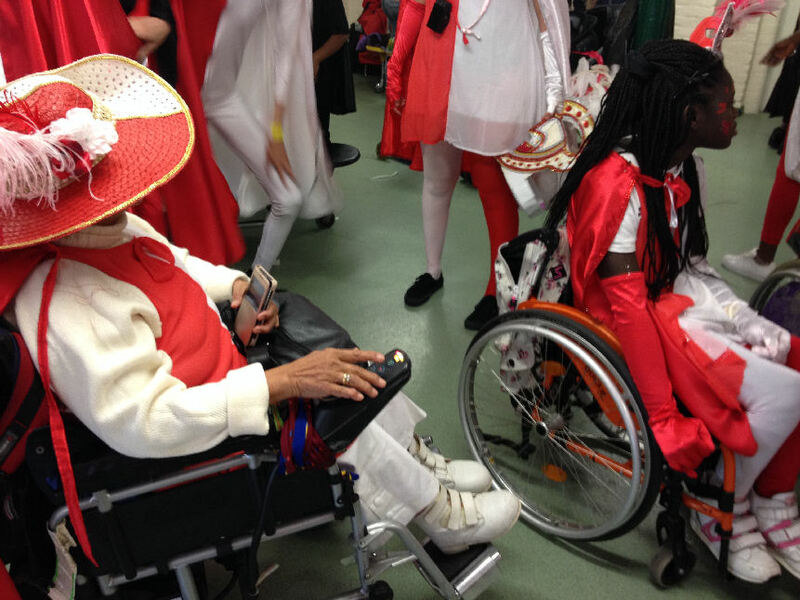 taking into consideration the planned moves, sign language, mobility and attention. 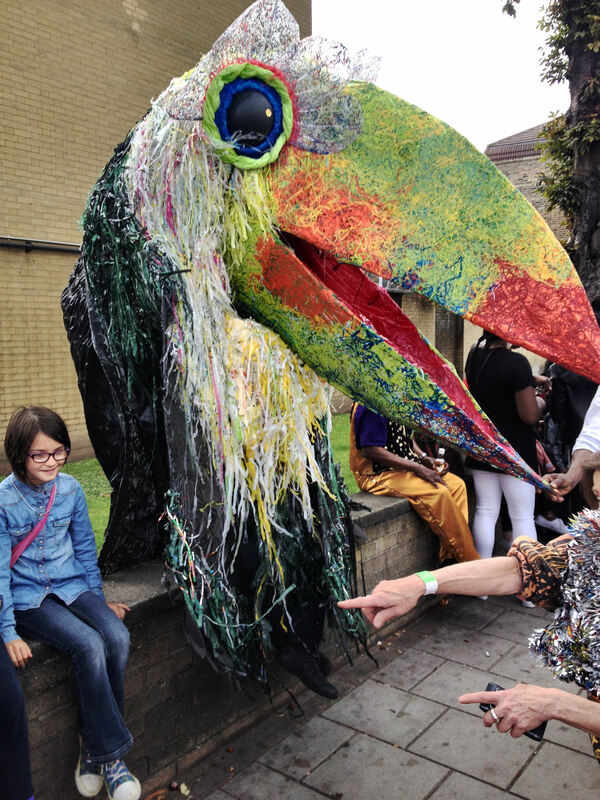 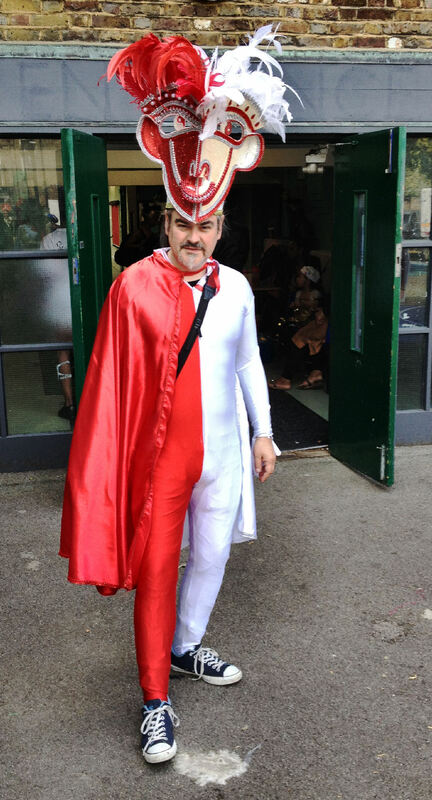 What did we make of Day 2 on the Community Festival trail ? 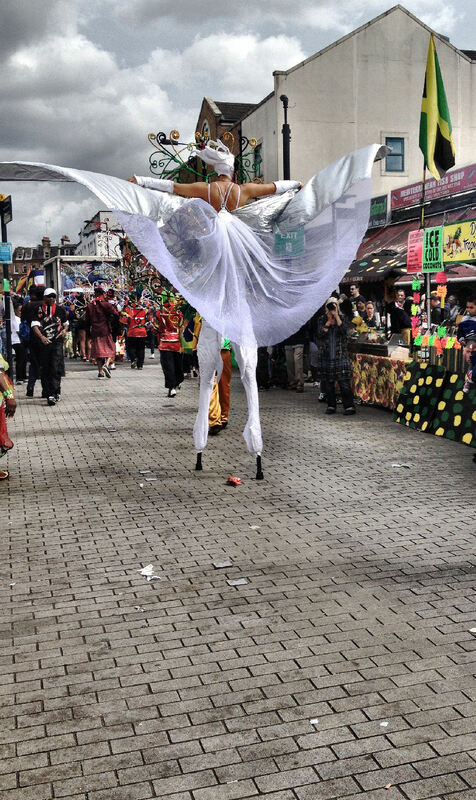 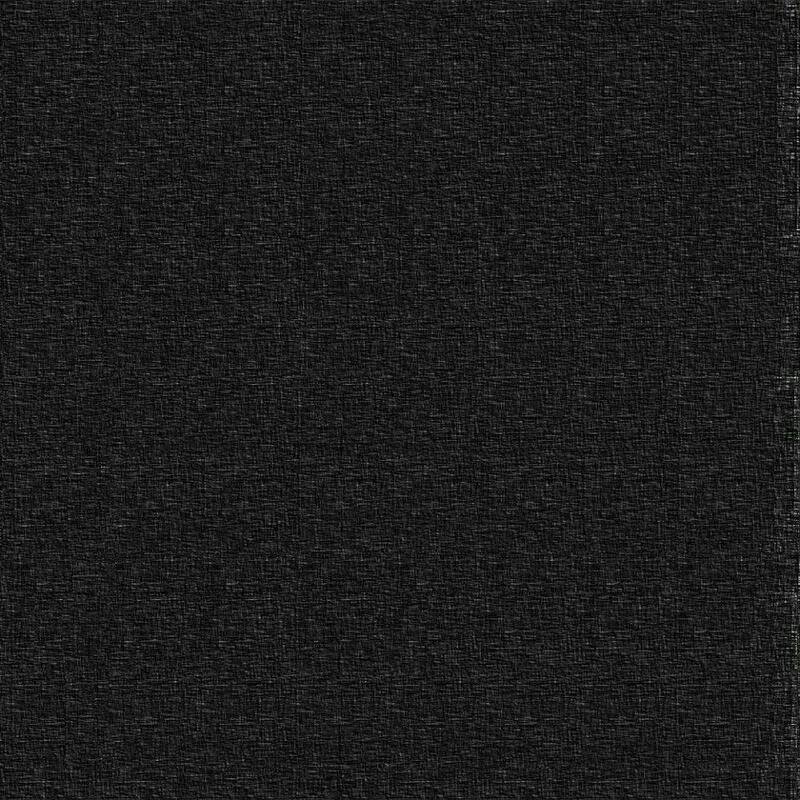 Highs – An amazing an engaging experience for everyone, great fun, fantastic , colorful, vibrant, stimulating at all levels. 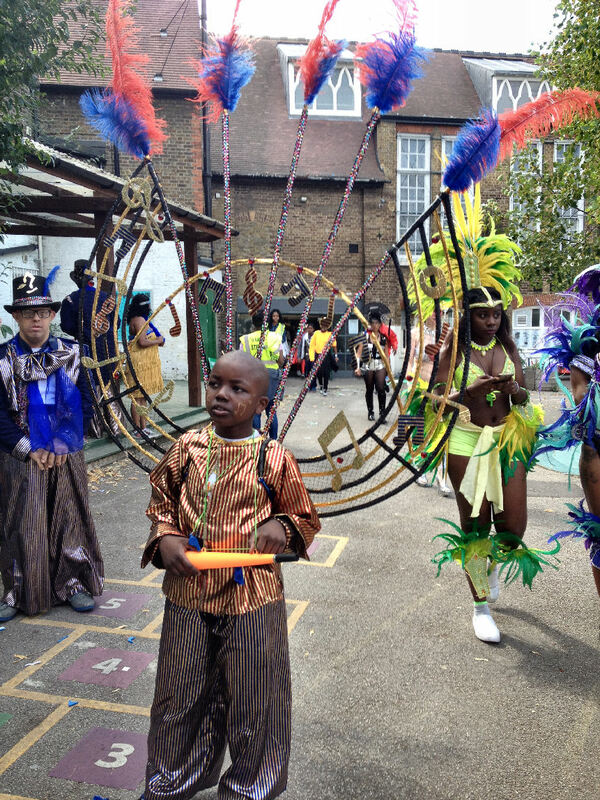 Friendly and a safe atmosphere, excellent use of local schools and changing and preparation sites close to the carnival route. 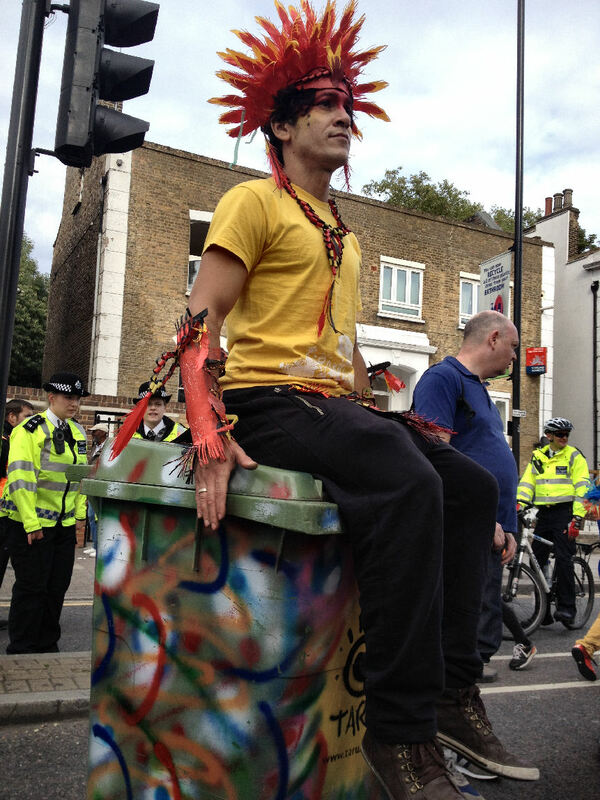 Excellent traffic control with fast taking down of the route so there is no traffic build up after the event. 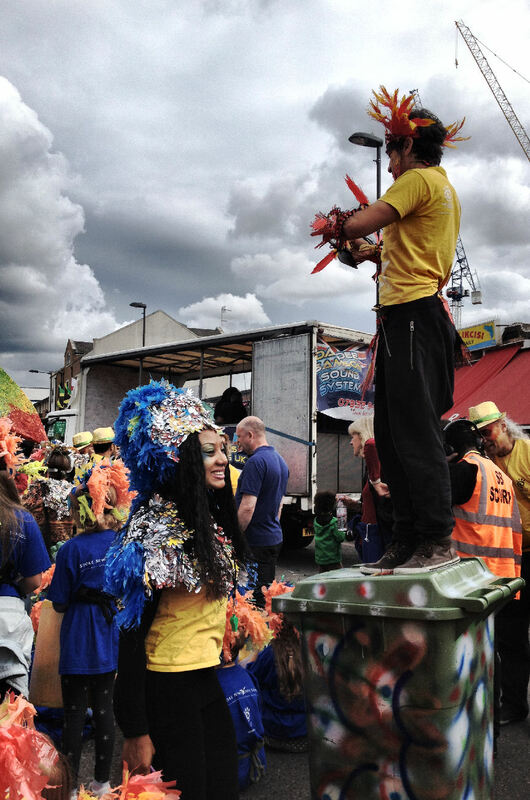 The Carnival has lots of exit points so there is no chance of being kettled. 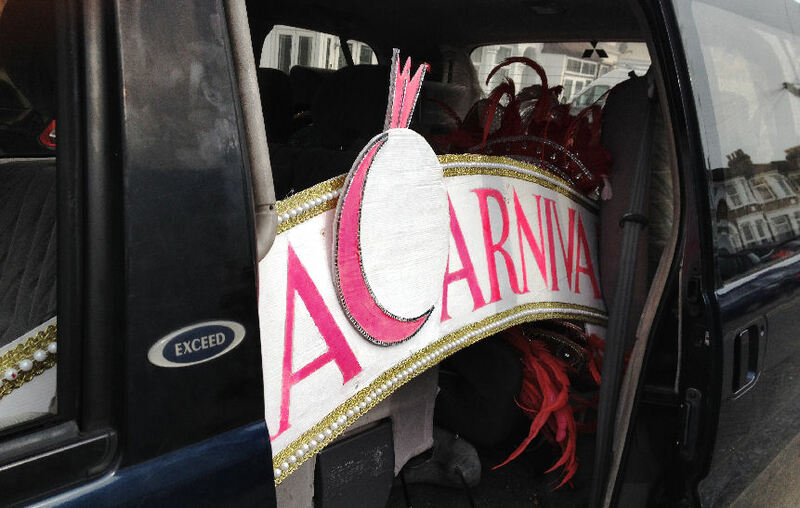 Forward planning in use of the support bus. 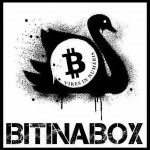 Lot’s of Media and Press, well funded. 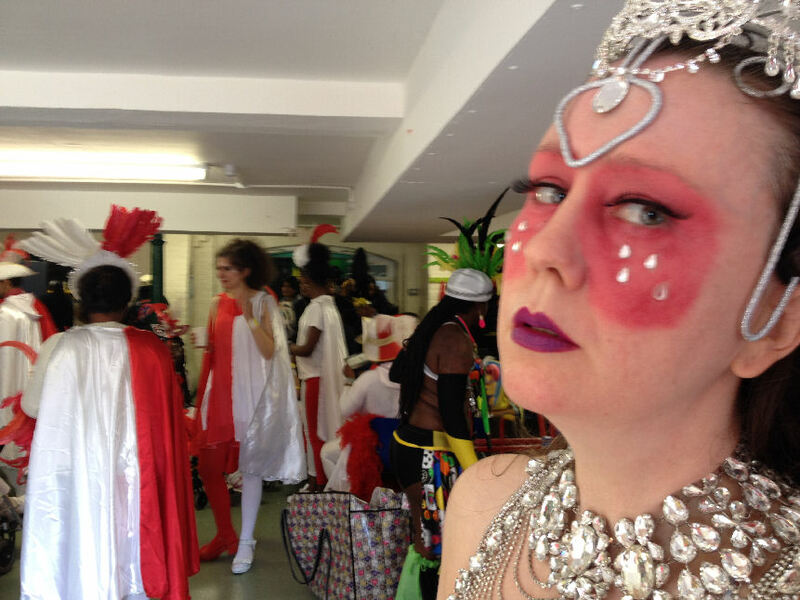 Lows – Serious lack of Toilets…(need more). 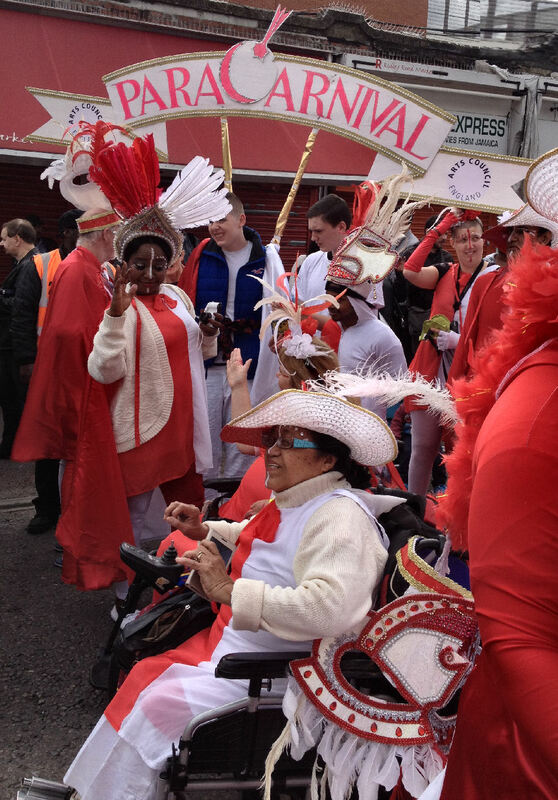 The route was very long for Special Needs which meant we had to be extra vigilant for signs of fatigue. 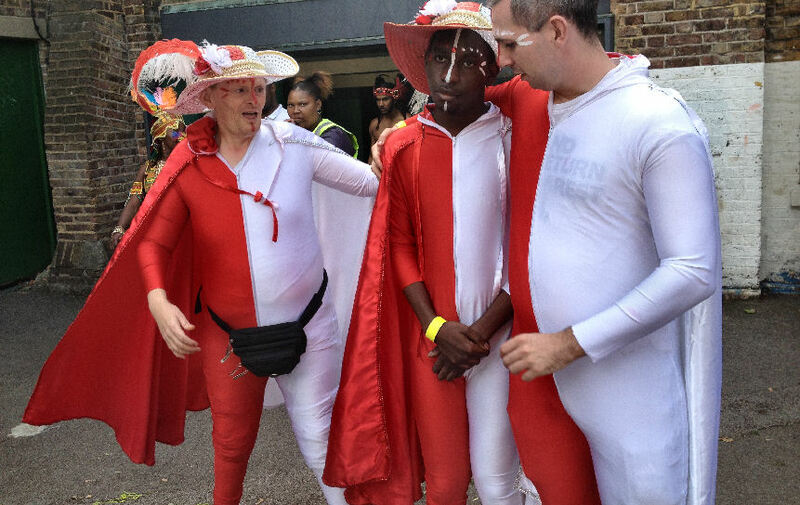 The dance moves seemed a little fast and complex for the group even we had trouble keeping up with the sign language.